When I first heard about “Real Heroes”, I was interested in giving this film a shot because of the concept of the film. It’s a mockumentary about superheroes living in a house for a reality T.V. That premise sold me on this film, as I had to check this out for better or worse. The film is about a desperate producer, who is looking for a hit TV show. He comes up with an idea where superheroes live in house and fight crime. With all the good ones wanting nothing to do with the project, he finds a bunch of B-list superheroes that no one has ever heard of to live in a house. This includes a single mon with a rebellious teenager, a marksman that’s moody about a breakup with his sidekick, a hunky hero who is looking for fame, a spoiled rich kid who wants to prove that she’s better than her father’s explosive weapons and two teen superheroes who are trying to run away from their past. There all have some superhero power along with excessive baggage in this comedy. Going into “Real Heroes”, I was hoping that it was going to be a film that I would enjoy. Sometimes you go into a film and thinking you’re going to like it and yet you enjoy it more than you anticipated in a positive way. It happened with this film as this was a very funny film from start to finish. Most of it had to with the direction of the film. Writer/director Keith Hartman does a very good with the way that he handles some of the film’s short comings. When you watch a superhero movie or spoof, you expect lots of lots of special effects. This film has very little of that here. Hartman makes up for that short coming by having most of the superhero action done thought various comic book artwork panels. It works very well, as it helps keeps the budget very low while giving you a visualization of the action that takes place. Also, it gives this film its comic book feel which is need to sell the superhero elements that the film is trying to convey on its budget. The other thing that makes Hartman’s direction good was the way that he handles the acting. The acting felt like something that you would see during a reality show. But what makes it work was the fact that Hartman’s direction makes sure that each of the cast stood out with their character. It made the film fun and it also made some of the film’s funny dialogue work. Hartman’s screenplay was also very good. This screenplay does a very good job providing laughs throughout. Whether it’s the way the dialogue was written to how some of the outrageous scenes were created, everything had a humorous tone to it. It really helped my enjoyment of the film as I was engaged with the material and was interested in seeing this instead of just reviewing it. The other thing that I liked about the screenplay was the fact that Hartman does a very good job creating characters that will grab your interest. From each of the characters traits to the comic book like storytelling, it made the story interesting enough that the comic book geek would enjoy. It’s one of the funniest ultra-low budget comedy that I’ve seen in quite some time. 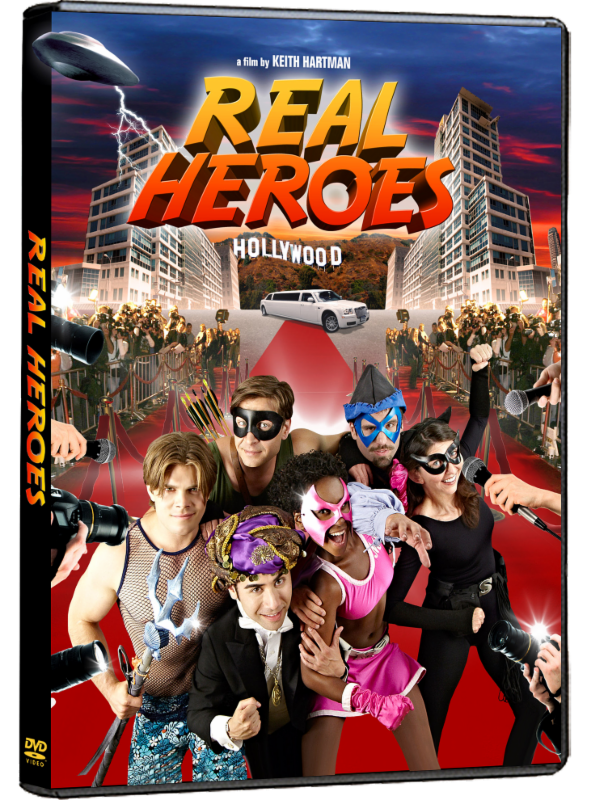 “Real Heroes” is a very funny film that even comic book fans will enjoy and laugh out loud.